Since last reporting in on my theatre adventures, I’ve seen some great plays and I’ve left some un-great plays. Kunene and the King is an exceptional play. The kind you know will be discussed in decades to come. Like when someone brings up Jess Butterworth’s Jerusalem with Mark Rylance, that you (okay maybe I), disappointedly missed. Thankfully dear reader, this one is still playing. It ticks all the boxes. 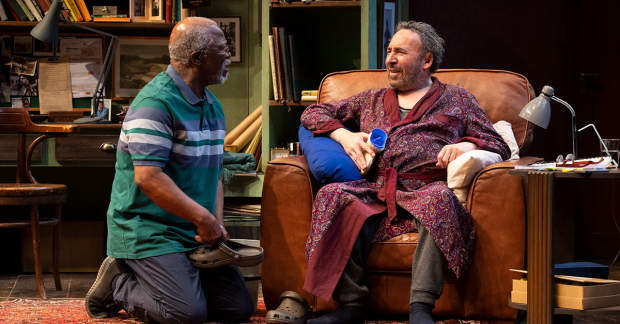 There’s no interval (thank you); two actors; shown in a small theatre; the chemistry between the actors supreme, the dialogue – authentic, accessible, as if you’d said/thought it yourself (but you didn’t), and perfectly character pitched…but I think I already said that. The relationship between the two is loving and uncomfortable and thoughtful and at times prejudiced and constructed by their unshared/shared history. This is twenty five years since the end of apartheid but there’s still so much undiscussed, unexplored, and unresolved. There are also some beautiful high moments, like when they are discussing King Lear. Not only reading and practising the text, but talking about it – in everyday terms, placing it very much in our understanding of it in society today. If I could present every young person with a seat in the audience I would. Shakespeare is not just honoured, but also understood. But I think my enjoyment of the play was more than this. It was listening to the experience of being in a ‘taxi’ in Soweto; it was the gratefulness to the playwright (John Kani, who is also one of the actors) for gifting us with such a thoughtful representation of South Africa today; it was watching two great actors – perform; it was the triggering of memories of visiting such a tough and strong nation in my younger and not so younger years. My pleasure also came from attempting to understand the issues from a distance, even with my own perceptions and ideas of older age, illness and politics. 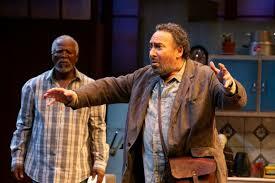 Did I mention the actors?….The dynamic between both John Kani and Antony Sher is feast-filled. They are not just great actors, but together sublime.